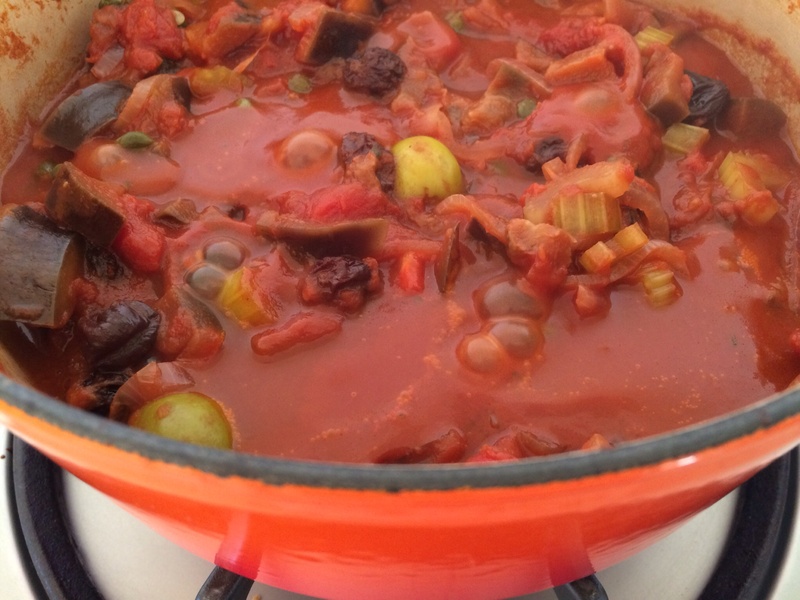 The vegetables are quick to prepare, but need to simmer for about an hour to release all the delicious flavours. 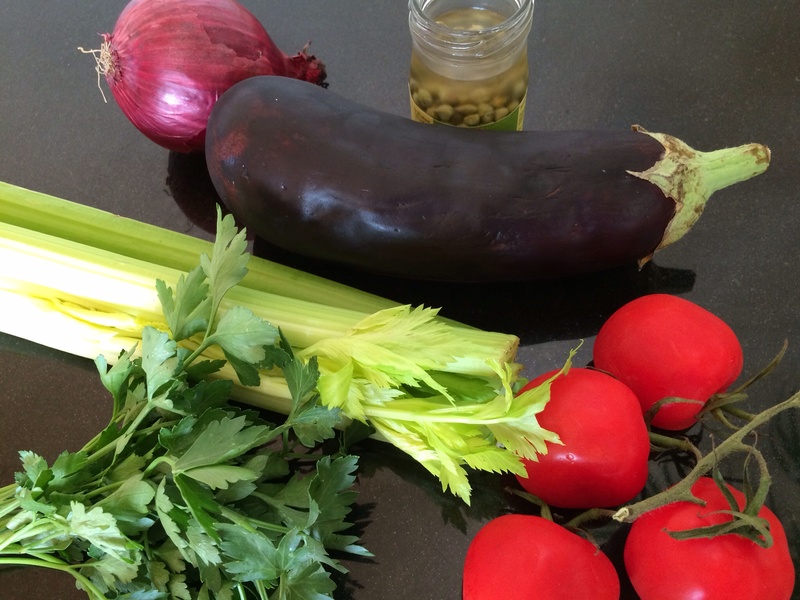 I am not using a lot of olive oil, which aubergines generally like to soak up a lot of, but using the juice of the tomatoes and some extra added water to give the dish the moisture it needs. I’ve been reading this week about food waste. (See below the recipe for some surprising foodwaste facts.) Not wishing to add to the incredible amount of good food that hits the global waste bin, I have decided to use up a few rather sad looking vegetables from my fridge. So this recipe is a bit flexible based on on what was available. The main ingredients, aubergine, celery sticks, onion, tomatoes, olives are often hanging around in people’s fridges I think! Serves 4. Slice the aubergine into smallish chunks, about 2cm. Slice the onion and celery. 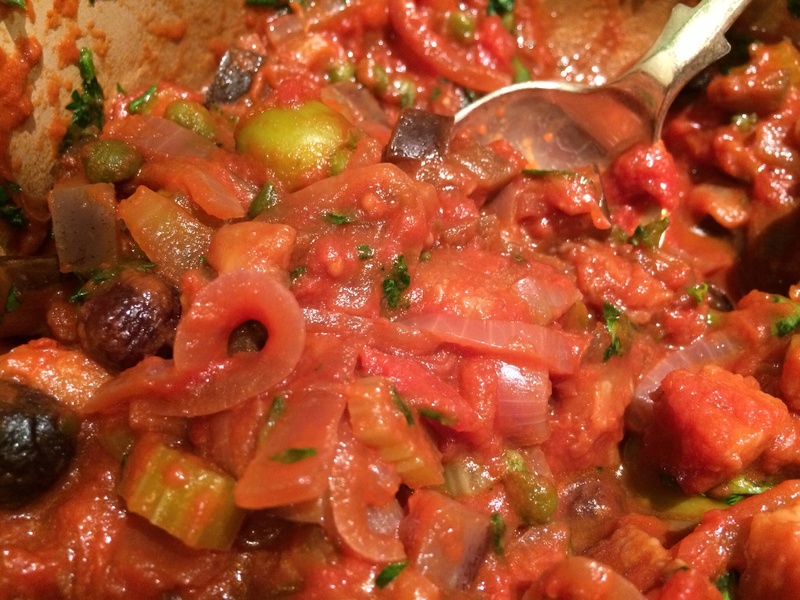 Drizzle a little olive oil into a pan and add the aubergine, onion and celery to the hot oil, stirring for a minute. Then add the tin of tomatoes. Half fill the can with water and add this to the pan too. 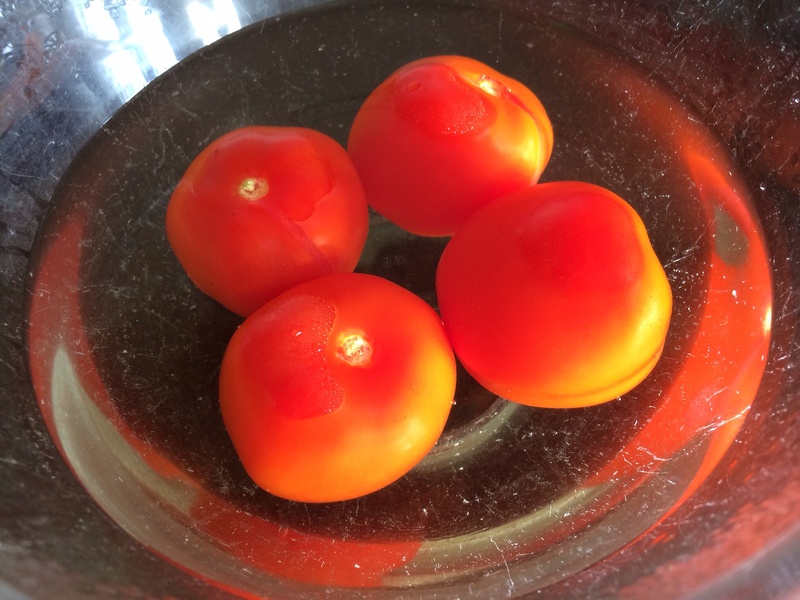 If you have a few fresh tomatoes looking like they could go into the pan put them into a bowl of boiling water for a few minutes. Remove with a slatted spoon, skin them and roughly chop them. Add them to the pan with the chilli flakes, dark grated chocolate, raisins, olives, capers, vinegar and gently stir. Season with salt and pepper. Cover the pan and very gently simmer for about 1 hour. Towards the end of this time check the seasoning. Add a teaspoon of brown sugar if you feel it is not quite sweet enough, although I tend to think that the raisins add enough sweetness. Add the chopped fresh herbs and pine nuts and either eat warm or cold. According to a report by the UN Environment Programme approximately one third of all food produced is wasted, either in food production or non consumption. So next time think before you scrape the remnants off your plate! Chef Hugh Fearnley-Whittingstall has said that shoppers should not be ‘terrified’ of use by dates, and said people won’t ‘drop dead’ if they eat food that is past its best before date. Britain is the food waste capital of Europe. According to Love Food, Hate Waste, 7 million tons of food are thrown away every year in the UK, 50% from households. You can watch Hugh’s War on Waste on BBC One on Monday 2 November at 21.00. Be a smart shopper and think about what you need before you buy. 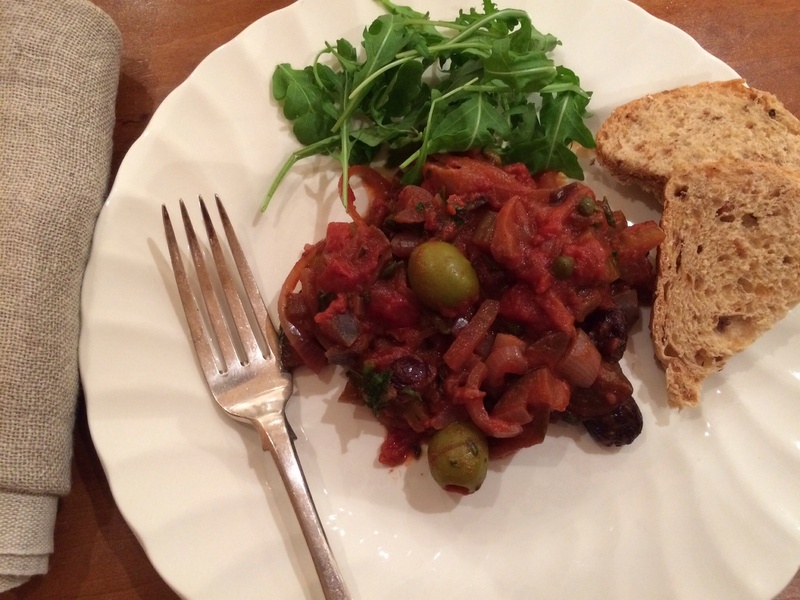 If you want to read more have a look at the Think.Eat.Save food waste campaign. Feeling inspired , love the idea of adding some chocolate ! Oh good! Yes adding dark chocolate adds a little bit of something to it!